The mission of this department is to strive to achieve the continuous maintenance, repair, and timely service of the Nation’s facilities, properties and various equipment. Building Maintenance provides a safe, clean and well functioning environment for the Nation’s workforce. This department also manages the use of the Rock House and Old Bingo Hall. Scroll down for more details on building rental. Skilled Tradesmen & Laborers: All crew members have experience in drywall, painting, roofing, cabinetry, carpentry, gardening, masonry, piping, and operating heavy equipment. Certified Pool Operator: One staff member tends the Boys & Girls club pool and the Senior Housing spa. 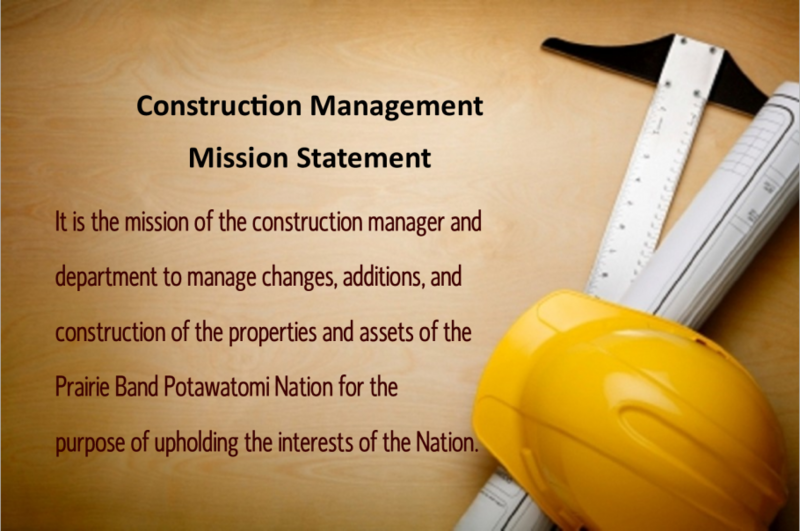 The department is comprised of one employee who shares in the duties of being a construction manager, building maintenance director, and participation with Prairie Band Construction.